Manchester United manager Jose Mourinho has spoken out on handing young defender Diogo Dalot his debut for the club in tonight’s Champions League clash against Young Boys. The Portuguese teenager joined United from Porto in the summer, and Mourinho clearly seems to rate him highly as he discusses his credentials ahead of tonight’s game. Quoted on the United fan account United Xtra, the Red Devils boss praised Dalot’s record at youth level so far, as well as for Porto’s senior team last season. ‘It’s a very good opportunity for him (Dalot) but again, I say the team is more important than anyone and we have to try to start the group phase well with three points,’ Mourinho told BT Sport. ‘His first match last season was big, a Portuguese derby and then three days later he played against Liverpool in the Champions League. MUFC have a proud record of bringing through top young talent, so will hope Dalot can be the latest to shine at Old Trafford. 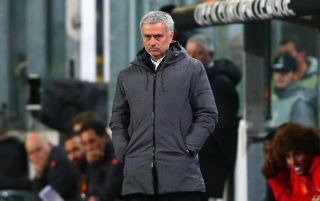 Still, this kind of tinkering to the team could well backfire for Mourinho as he surely needs a victory tonight as anything else would leave his side under big pressure to get results against Juventus and Valencia in this tricky-looking group.